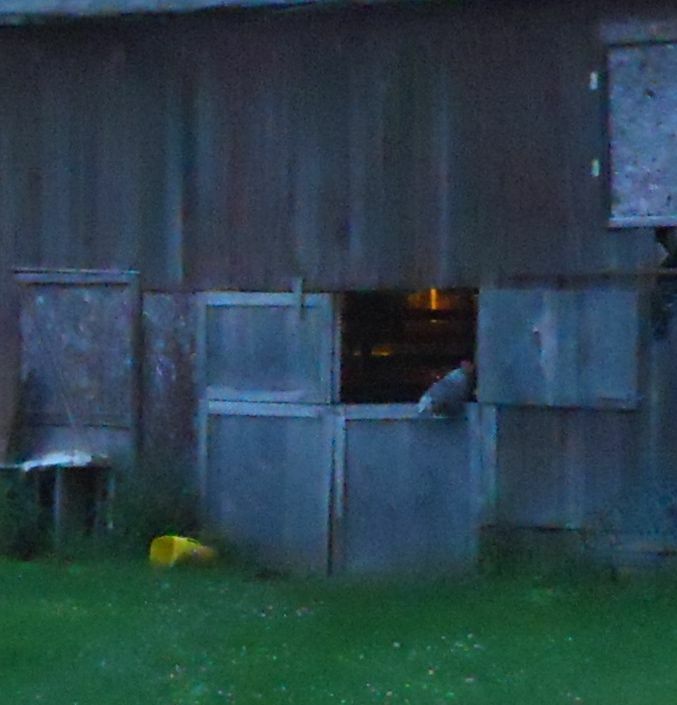 Whatever got Ari Duckass has been back, grabbing hens from inside the barn. Two were taken over the weekend. I thought I had closed off the entrance route after the first, but then last night it took my Scruffy. So this morning before work I found the route by the trail of feathers and have done my best to close it up. 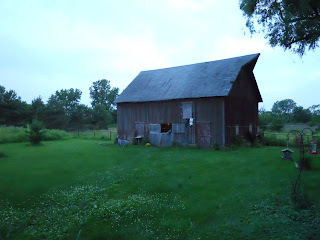 I've been visiting the barn frequently to make sure all's ok. Around 8:00 tonight I stepped out of the house. Something looked unusual. Yes, that's right. 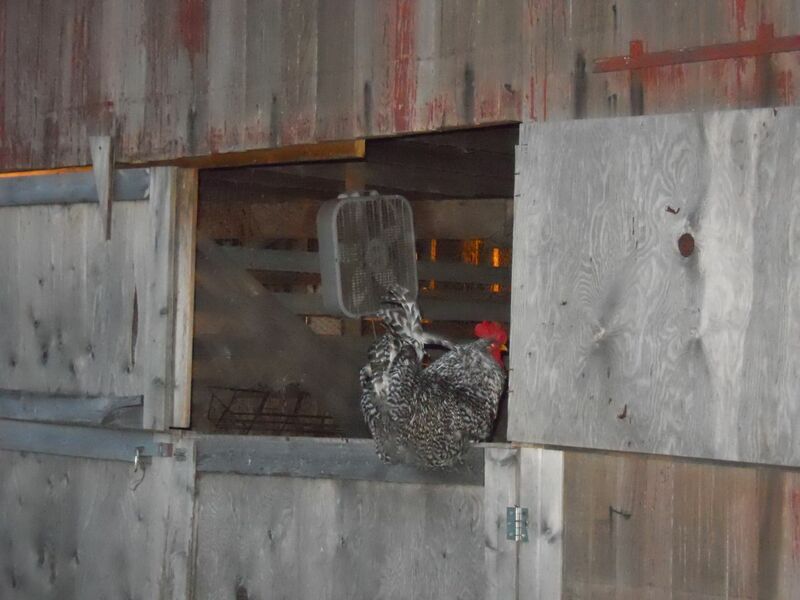 Egglebert was perched on the dog yard side of the barn. Luckily I grabbed Ulani and tethered her before there was another tragedy. 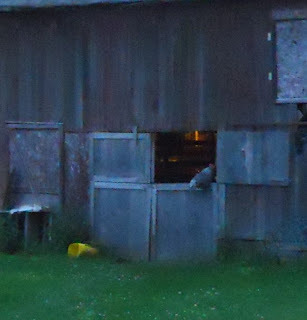 Obviously he is not comfortable staying in the part of the barn where he's been for the past month or so. And who can blame him, it's the first section the predator enters. But we know he cannot be in with the white roosters. So I did some juggling. Two roosters and nine hens are in the back section of the coop. The third rooster and Eartha Chick are in the front section. And that leaves the middle section for The Wacky Quackers, Smokey, Lacey, and Egglebert. All the chickens have roosts up high to help secure them. Ducks are the "low hanging fruit", but I did my best to block the door into the coop. I left a light on in the barn so any approaching danger is not as hidden. Christ, it's like the trailer to some horror movie. Maybe you could setup a live trap and see if you can catch the predator(s). Now that they know where the chicken dinners are you will probably have to remove them. It will pester you until you have no birds left. Hope everyone was safe last night. How did it go? Monday night was calm. But maybe the predator was just sated and didn't bother coming out! We must be diligent!